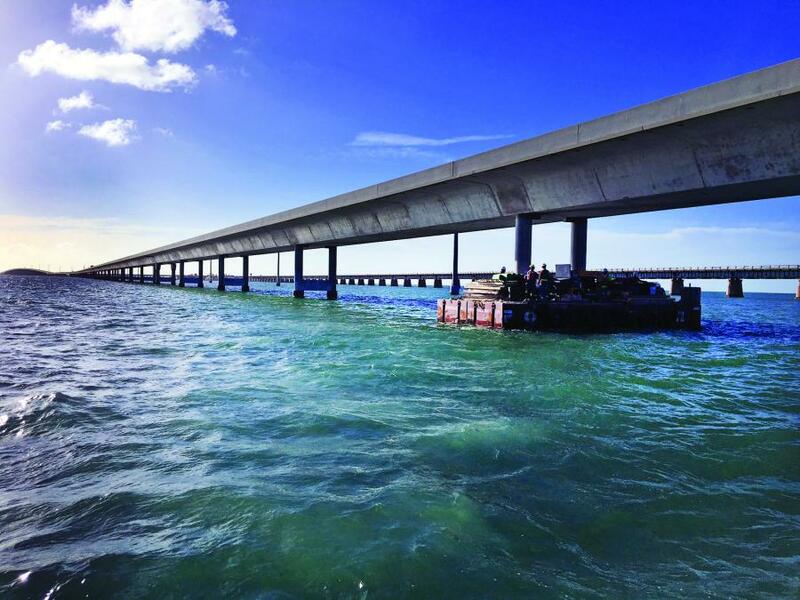 The two Seven Mile Bridges span the turquoise waters of the Florida Keys — the newer vehicular bridge (on right) is undergoing a $14.9 million rehabilitation. 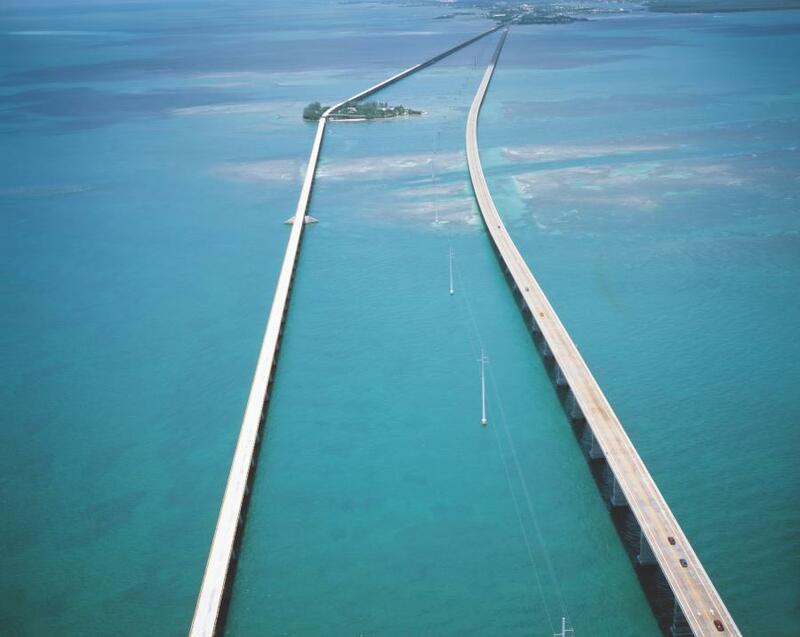 When driving on the iconic Seven Mile Bridge in the Florida Keys, one can see breathtaking views of the Atlantic Ocean and Gulf of Mexico. The scenic view, at least for the next couple years, also will include a Thom-Katt trailer-mounted concrete pump working from the edge of the bridge at times, and more frequently from a barge below. 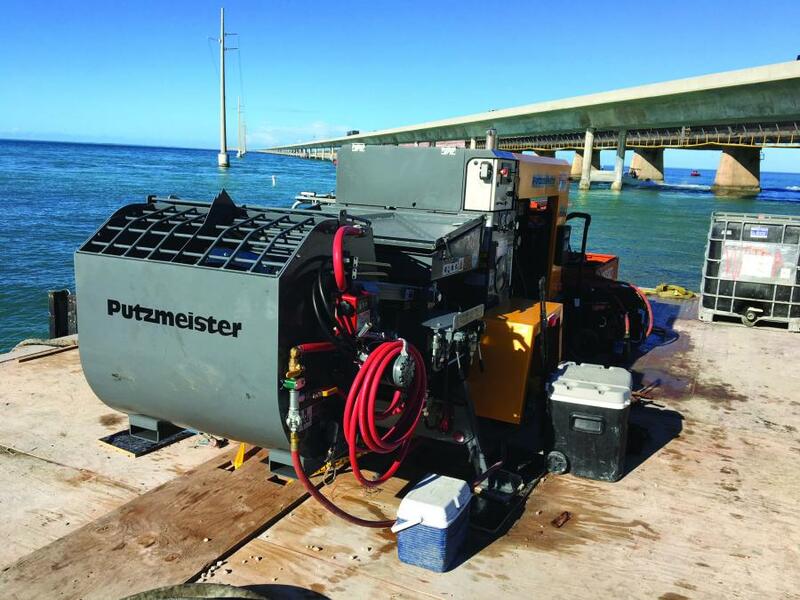 The small yet robust trailer pump, manufactured by Putzmeister America, is meticulously placing specialty concrete mixes in challenging areas both above and below the turquoise waters, helping to repair the bridge that was built in 1982. The project is highly intricate and very time-consuming. 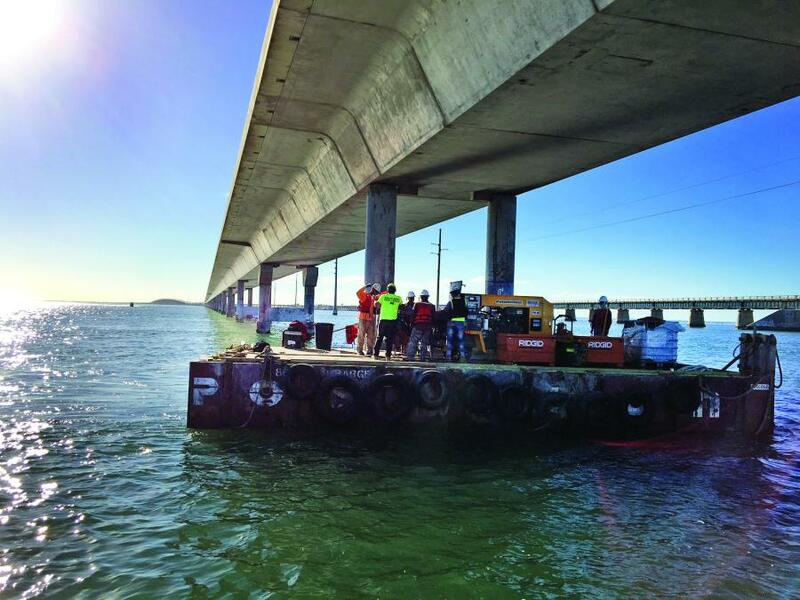 It not only encompasses concrete placement for complicated repairs, often using four to five divers for underwater pours, but it also requires this specialized work for an extensive seven-mile span — the bridge is one of the 10 longest in the United States. Pumping a total of 420 cu. yds. of concrete over two years will not set any records for volume and speed, but it is the required amount of concrete and time to complete a $14.9 million contract for the Florida Department of Transportation. Although the job is complex, general contractor Southern Road & Bridge LLC, based in Tarpon Springs, Fla., readily takes on specialty projects like this. Its primary focus is the transportation and infrastructure needs of state and municipal authorities, offering turnkey solutions to clients primarily in the southeastern United States. To meet the job's demands, the contractor selected the TK 20 trailer pump model, as it offers the ideal output for the smaller pours required — up to 17 cubic yards an hour. Plus, the unit's compact dimensions, 74.5-in. width and 174-in. length, takes up less space on the barge. The general contractor's project manager Juan Anderson, with 13 years experience in bridge rehab, understands the need for the right equipment to achieve efficient concrete placement while in a precarious location on the water. “The Thom-Katt had the specs and compact size we needed, but its biggest selling point was the detachable mixer designed for it. The mixer allows us to control the speed of the mix; and we can easily attach or remove the mixer when needed,” he said. The detachable feature is important because the project requires a combination of pre-bagged mixes and ready-mixed concrete. The pre-bagged ones are a 6,000-psi at a 28-day break and requires using the hydraulically operated mixer, with its 13-cu. ft. capacity, when on the barge. Meanwhile, the ready-mixed concrete, with its larger aggregate size and several corrosion-inhibiting additives, must be discharged from a truck mixer. This requires setup of the trailer pump on the edge of the bridge to accommodate the work below. All mixes are designed to better withstand the effects of the corrosive salt water. The general contractor purchased the trailer pump and mixer from Thomas Concrete Machinery, authorized Putzmeister distributor with locations in Miami, Tampa and Orlando. Thomas, highly knowledgeable about concrete pumping equipment, has been a leading domestic distributor of Thom-Katts for the past 20 years, achieving numerous top sales awards from the manufacturer. Their experience and expertise did not go unnoticed. “Jack Henegar at Thomas was very informative when quoting equipment that would work best for the project,” Anderson said. “The TK 20 was perfect for this particular application. It has twin-shifting material cylinders and variable hydraulics that allow smooth and precise control at the low outputs required for specialized projects like this bridge rehab,” said Jack Henegar, co-owner of Thomas Concrete Machinery — a family-owned business, covering the state of Florida with sales, parts and service of concrete equipment for more than 50 years. The bridge's rehab is occurring at a time when the need to rebuild the nation's crumbling infrastructure is a major topic in the news. About 54,259 of the 612,677 bridges in the United States are “structurally deficient,” according to a report released in January 2018 by the American Road & Transportation Builders Association. Americans cross these deficient bridges 174 million times a day. 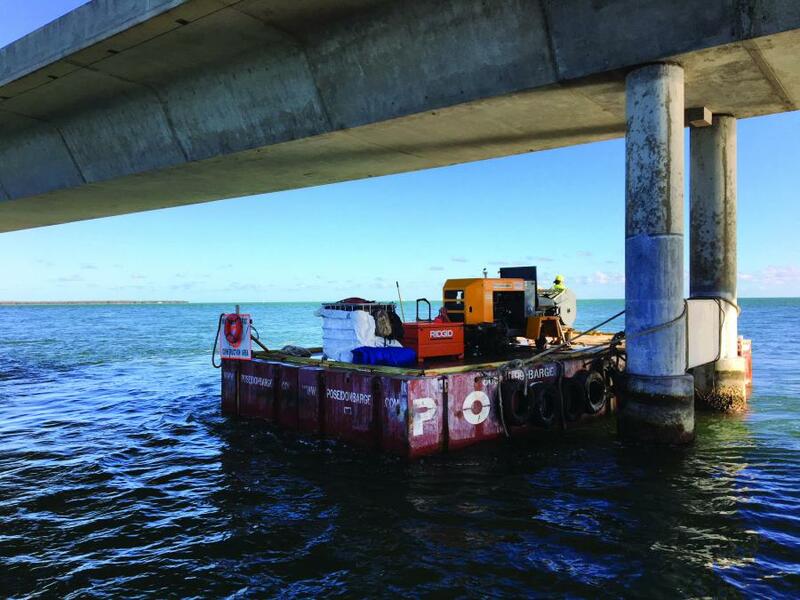 The Seven Mile Bridge involves many different aspects related to repairing the foundation and structures under the bridge, as well as replacing the navigational channel fender system. A significant amount of the project involves spall repair, which is the tedious task of chipping off cracked and delaminated concrete, called spalls, and replacing with new concrete. Spall repairs are required for 143 drilled shafts or caissons, 4-ft. in diameter, penetrating into the ocean floor. After replacing concrete for the shafts, the next step involves installing cathodic pile jackets around them. These jackets act as a protective barrier against salt water; and after they are positioned, a 3-in. \gap remains between the jacket and round shaft that must also be filled with concrete. To fill the gaps, that require a larger aggregate concrete with a FDOT SP457 design mix, the trailer pump is towed and set up on the bridge for use with a truck mixer. About 50 ft. of 2-in. delivery hose connected to the trailer's hopper travels down from the bridge's edge into the water, with divers assisting with the underwater pours. Similar to a tremie pour, concrete is pushed from the bottom of the pile jacket upward. Spall repairs also are required for concrete columns at most of the 266 bridge piers; and with two columns per pier, that adds up to a significant number. To perform the task with efficiency, construction crews are simultaneously working on different barges — one barge has a crew removing concrete at one pier, while another crew at another pier is handling the formwork. A tow boat moves the barges from one pier to the next. Then, on pour days, which typically occur twice a week, a crew of eight can be found on a barge with the trailer pump and detachable mixer placing concrete from pier to pier. The Seven Mile Bridge is one of the most famous bridges in the world, given its appearance in blockbuster movies like License to Kill and True Lies. The bridge is 440 sections of concrete designed in a box girder structure. At the center of the bridge is a 65-ft. high arch, while the rest of the bridge is teetering close to the water. The bridge has won numerous prestigious awards for excellence in architecture. The original Seven Mile Bridge (Old Seven), built in the 1900s, still exists, but it is for pedestrians and cyclists only.